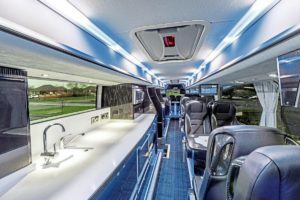 Plaxton Elitei coaches join Swans Travel’s fleet. Posed under atmospheric winter skies are Swans Travel’s latest additions to its fleet, a pair of Plaxton Elitei coaches. Managing Director of the Manchester-based operator, Kieran Swindells, is passionate about continuous investment in what he describes as modern, pace-setting vehicles designed to feature the latest in safety, luxury and low emission technology. He sees these new additions as a fitting tribute to the company’s 40th anniversary, a landmark it reached last year. They are not the first Plaxtons to enter the operator’s fleet, having had four Leopards in 2016 and 2017. The new coaches will operate out of the company’s headquarters at Broadway Business Park, in Manchester, and while they will complement the wide range of corporate contracts, inbound tours, conference and event transport services provided by Swans Travel, they will essentially be focused on high profile team transfers and VIP events, notably those associated with sporting occasions. 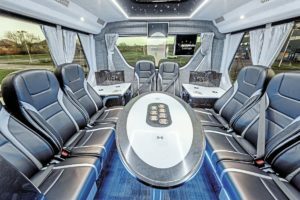 The company was recently awarded the team transport contract for the 2019 Cricket World Cup. The operator tends to have a year’s buying and then have a break for 12 months. However, a potential contract win could see it continue investing this year.